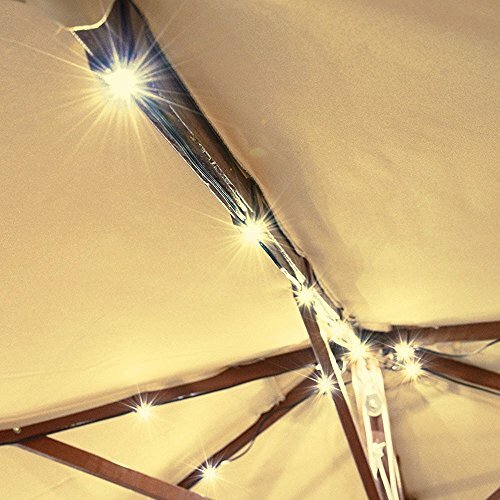 This LED Solar String Lights fit for our 8ft/9ft 8 rib Outdoor Patio Wood Umbrellas perfectly. It adds instant warm feeling to outdoor in a very economical way. You can extend the enjoyment of your umbrella with a lighted canopy which illuminates your dining table or entertaining area well after dark. So cool, so beautiful and romantic! * Create romantic ambiance and ample warm lighting for outdoor patio & table umbrellas. * Powered by the sun, no electric wiring required. * Latest improved solar panel, high conversion rate and long usage time. * Energy-efficient and energy saving. * Easy to use, safer than candles. * Each String Length: 52-3/4"